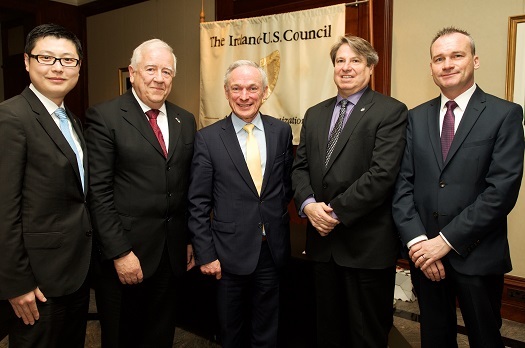 The 2019 Spring Corporate Lunch of the Ireland-U.S. Council was held in Belfast on April 12. Seen at the event were Dr. Michael J. Somers, President of the Council's Chapter in Ireland; Dr. Peter Fitzgerald, Chairman & CEO of Randox Laboratories who was a guest speaker; Jason Riley of the Wall Street Journal Editorial Board and the Manhattan Institute - also a guest speaker; Elizabeth Kennedy Trudeau, U.S. Consul General in Northern Ireland; and Joe O'Neill, Chief Executive of the Belfast Harbour Commissioners who graciously hosted the lunch at their magnificent corporate headquarters in Belfast. 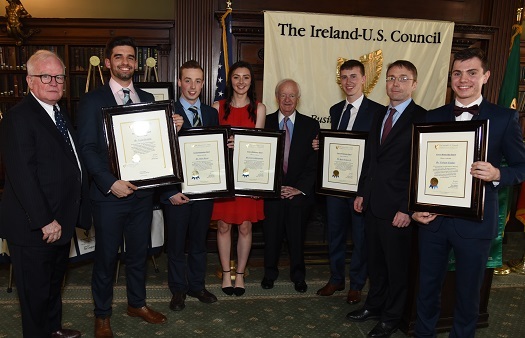 The Ireland-U.S. Council's 2019 St. Patrick's Lunch was held in New York on March 15. 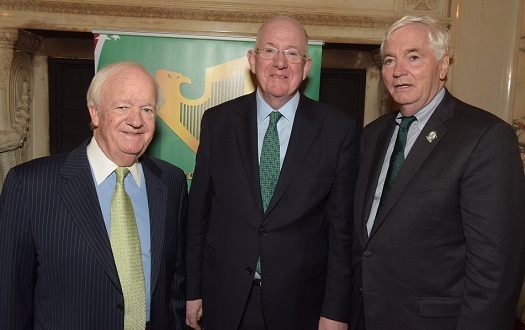 Seen at the annual festive occasion was Brian Stack, Council President; Charlie Flanagan, Minister for Justice & Equality in the Government of Ireland and Brian O'Dwyer, the 2019 Grand Marshal of the St. Patrick's Day Parade in the City of New York, who was Guest of Honor at the Lunch. 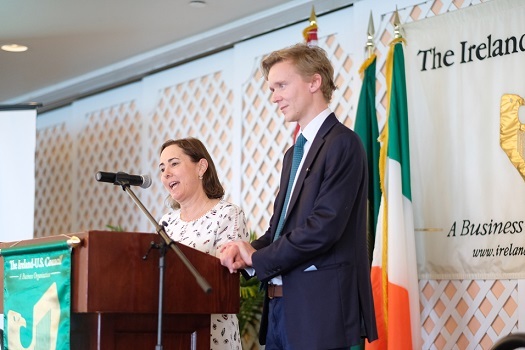 The 27th Annual Winter Meeting of the Ireland-U.S. Council was held in Palm Beach, Florida from February 13 thru 15, 2019. 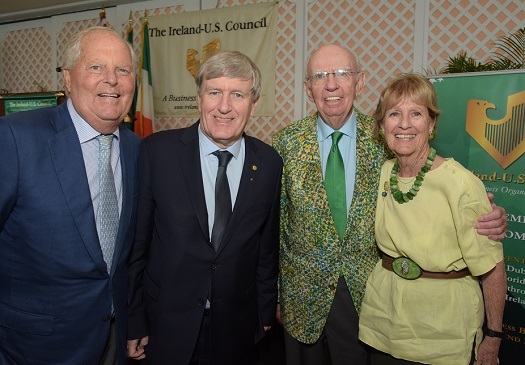 Seen at the Council’s Winter Meeting lunch were (from left) Council Board Member and host of the Winter Meeting’s Opening Night Dinner, Bill Finneran; Ireland’s Ambassador to the U.S. Dan Mulhall; Chairman of the 27th Annual Winter Meeting Michael J. Gibbons and his wife, Cynthia. Ambassador Mulhall spoke on Brexit and updated Council members and their guests on the matter which is of such growing concern in Ireland. The Winter Meeting lunch also featured a presentation on Investing in Irish Art by Arabella Bishop and Charlie Minter from Sotheby’s. The largest sale of Irish art from a private collection was held by the famous auction house in December 2018 by Palm Beach resident and Ireland-U.S. Council member Brian F. Burns. 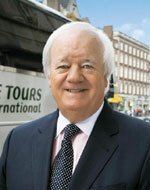 The 27th Annual Winter Meeting events were sponsored by Aer Lingus and by CIE Tours International. Seen at the Council’s 2018 December Member-Guest Reception held at the InterContinental Hotel in Dublin December 12 were (from left) Dr. Michael J. Somers, President of the Ireland-U.S. Council’s Chapter in Ireland; Bill Byrne, Director Global Sales for event sponsor Aer Lingus; Reece Smyth, Chargé d’Affaires at the U.S. Embassy in Dublin; Barry O’Callaghan, Chairman & CEO, Rise Global Holdings, who was a Guest Speaker and Dara Calleary, Deputy Leader of Ireland’s main opposition political party, Fianna Fáil, who also addressed the group. 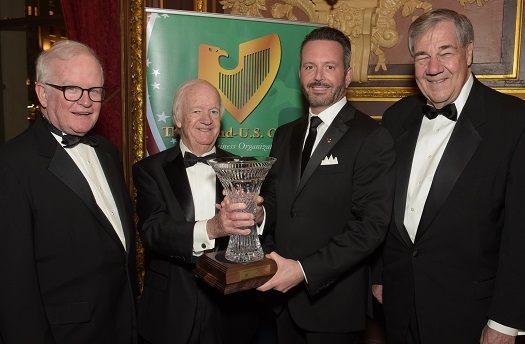 Seen at the presentation of this year’s Ireland-U.S. Council Award for Outstanding Achievement at the Council’s 56th Annual Dinner on Thursday, November 8, 2018 in the Metropolitan Club in New York City were (from left): Council Vice President John Reilly, Partner, Patton Squire Boggs; Council President Brian W. Stack; Brent Saunders, Chairman & CEO Allergan plc and Dennis Swanson, Council President-Emeritus. 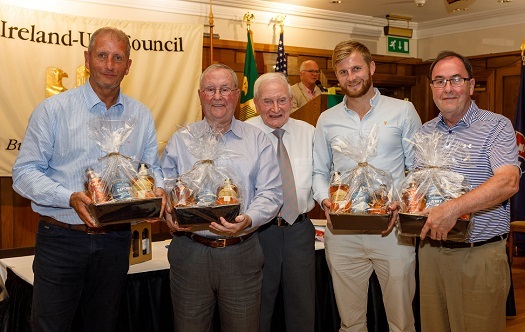 The Ireland-U.S. Council's 2018 Golf Day was held at Dún Laoghaire Golf Club on the outskirts of Dublin on Friday September 7, 2018. The event was staged in better weather than previous years and enjoyed by the full-field contingent of members and their guests. 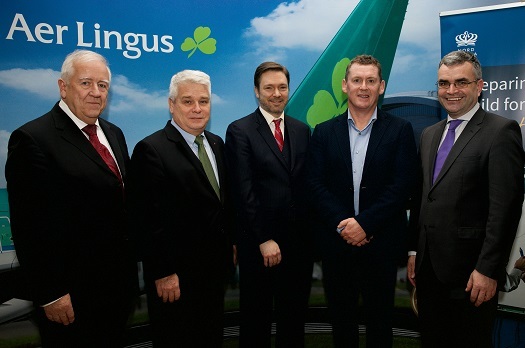 The occasion was sponsored by Northern Trust Bank and Aer Lingus. Seen at the event were (from left): Liam Butler of Northern Trust Bank; Aer Lingus colleagues Bill Byrne and Yvonne Muldoon; Roddy Feely, Executive Director, and Dr. Michael Somers, President of the Council in Ireland. 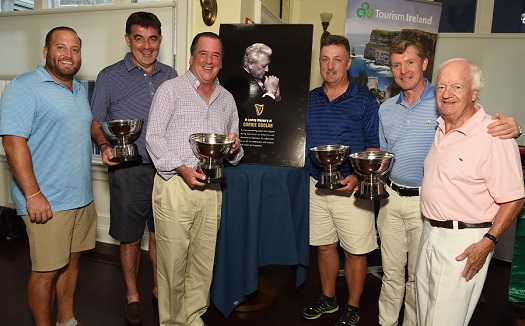 The 2018 Connie Doolan Memorial Golf Trophy was won by the golf team from Guinness. 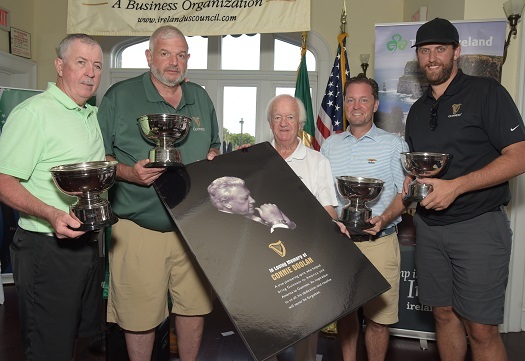 Council President Brian Stack presented the trophy at the Ireland-U.S. Council Golf Day at Rye Golf Club on Monday, July 23, 2018. Seen (from left) were Philip Sheridan, Keith Cussmano, President Stack, Council Member Bill Falvey and Chris McClellan. The event was sponsored by Tourism Ireland and by Guinness, a unit of Diageo. 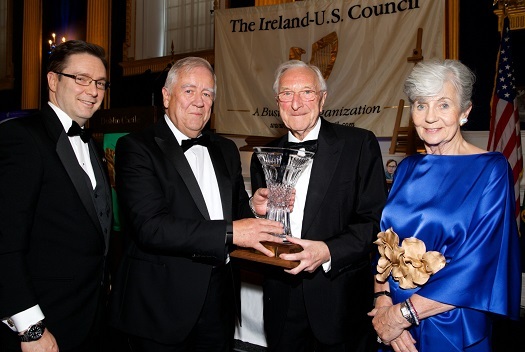 Council Ireland Chapter President Dr. Michael Somers presented a Lifetime Achievement Award to Martin Naughton, one of Ireland’s most successful entrepreneurs at the Council’s Midsummer Gala Dinner on Friday, June 29, 2018 at a dinner in Dublin Castle. Seen at the presentation were (from left) Reece Smyth, U.S. Embassy Chargé d’Affaires; Dr. Michael Somers with Martin and Carmel Naughton. Also at Dublin Castle the Ireland-U.S. Council’s Award for Outstanding Portraiture for 2018 was presented to Dublin artist Liz Rackard. Seen at the presentation were (from left) Ciaran Harvey, Pramerica, a unit of Prudential Financial who sponsor the initiative; Dr. Michael Somers; the winning artist Liz Rackard and Brigid Mulcahy of the Irish Arts Review. The Council’s 2018 Student Work Experience Scholarships awards luncheon was held at The Metropolitan Club in New York City on Thursday, June 14. 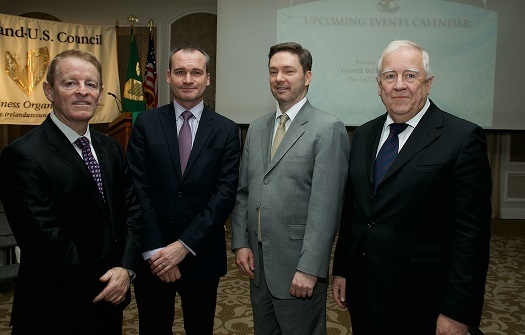 Seen at the presentations event were (from left) : John Reilly of Squire Patton Boggs who serves as Chairman of the Council’s Nominating Committee; Lucas Prodohl; Sean Grant; Lauryn Hollywood; Brian W. Stack, Council President; Sean Kilgarriff; Ciarán Madden, Ireland’s Consul General In New York; and Richard Clogher. Not pictured: Jessica Morgan whose citation and bursary check is being presented separately. 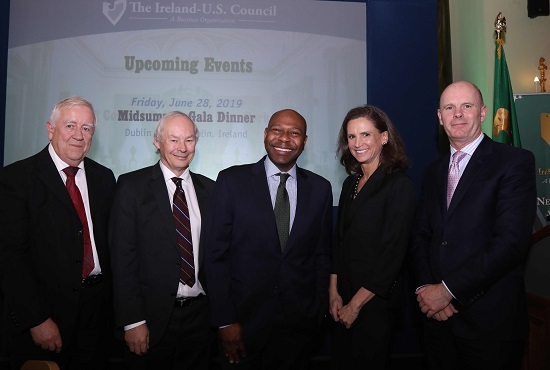 Ireland-U.S. Council 2018 Spring Corporate Lunch in Dublin Featured Double-Header Speaker Bill on Disparate Topics: Current American Political Trends plus Ireland’s Education Policies. The 2018 Spring Corporate Lunch hosted by the Ireland-U.S. Council was held at The InterContinental Hotel in Dublin April 13. The lunch featured a double-bill of speakers. John McLaughlin from New York’s McLaughlin & Associates discussed current political trends in the United States. Remarks were also delivered by Richard Bruton TD, Ireland’s Minister for Education & Skills. Seen at the event were (from left) Chen Tian, Senior Vice President, Bank of Ireland – Corporate Banking; Dr, Michael J. Somers, Council Ireland Chapter President; Guest Speakers Richard Bruton TD, Ireland’s Minister for Education & Skills and John McLaughlin with Alan Molloy of Aer Lingus. The event was sponsored by Bank of Ireland - Corporate Banking and by Aer Lingus. 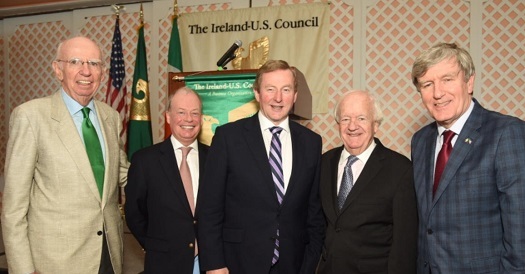 Seen at the Ireland-U.S. Council St. Patrick’s Lunch in New York on Friday, March 16, 2018 were (from left) Michael J. Gibbons and Dennis Swanson, both former Council Presidents with Guest Speaker Danny McCoy, Chief Executive of Ibec in Dublin; Guest of Honor Loretta Brennan Glucksman, Grand Marshal of the 257th St. Patrick’s Day Parade in the City of New York; and Ireland’s Minister for Immigration & Equality, David Stanton TD. The Council’s 2018 Winter Meeting featured a luncheon held at The Beach Club in Palm Beach FL on Friday, February 13, 2018. 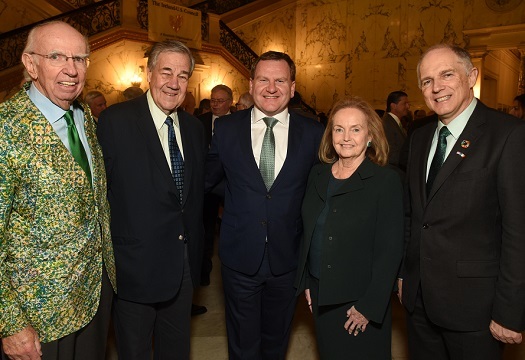 Seen at the event were (from left) Council President-Emeritus Michael J. Gibbons; Norman Houston, Director of the Northern Ireland Office in Washington DC; Former Taoiseach (Prime Minister of Ireland) Enda Kenny TD; Council President, Brian W. Stack; Ireland’s Ambassador to the United States, Dan Mulhall who was a Guest Speaker at the Lunch. 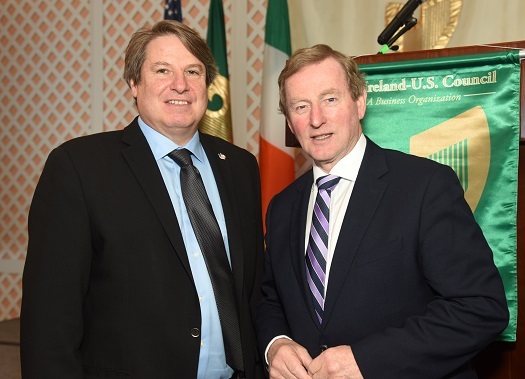 Also speaking at the Council’s 2018 Winter Meeting was John McLaughlin of McLaughlin & Associates, who ran the polling operations for the Trump Presidential Campaign – pictured here with Enda Kenny. Seen at this year’s Ireland-U.S. Council December Member-Guest Reception held Wednesday, December 13 in Dublin were (from left): Guest Speaker, Eamonn Brennan, Director-General of Eurocontrol, an international air traffic management agency across Europe with 41 member states which is headquartered in Brussels, Belgium; Alan Molloy of Aer Lingus who sponsored the occasion; Guest Speaker Reece Smyth, Chargé d’Affaires at the U.S. Embassy in Dublin and Council Ireland Chapter President Dr. Michael Somers. 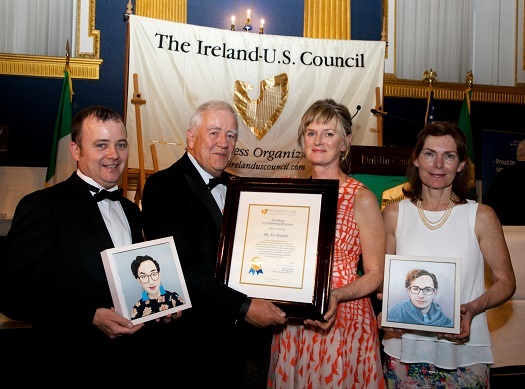 The Ireland-U.S. Council presented its Award for Outstanding Achievement in 2017 to Bernard Byrne, Chief Executive of AIB Group, one of Ireland’s most important banking institutions which has undergone a dramatic restructuring and been nursed back to financial health under his stewardship. The award was a highlight of the Council’s 55th Annual Dinner held at the Metropolitan Club in New York City on Thursday, November 9, 2017. 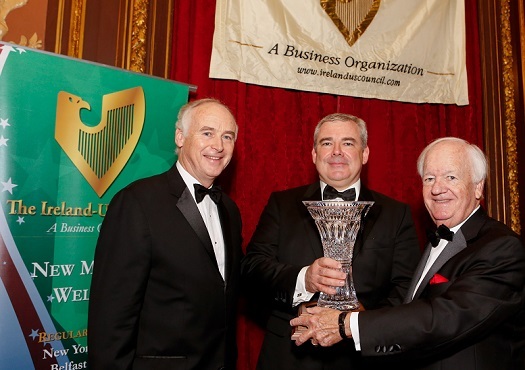 Seen at the presentation were (from left ) Ireland-U.S. Council Board Member Dr. John Fitzpatrick, Chief Executive of Fitzpatricks Hotels; Bernard Byrne and Brian W. Stack, the President of the Council. 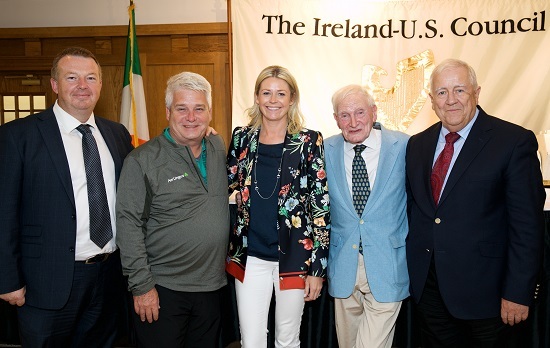 The Ireland-U.S. Council's 2017 Golf Day in Ireland was held at Dún Laoghaire Golf Club in Enniskerry, County Wicklow, near Dublin, on Friday, September 8. The event was staged and enjoyed by the full-field contingent of members and their guests and was sponsored by Northern Trust Bank and Aer Lingus. Seen at the presentation to the winning team were (from left) Mick Galvin, Diarmuid Hogan, Council Executive Director Roddy Feely, Stephen Walsh and Kieron Hogan. The Winners’ Prize Baskets were sponsored by Council member Kevin Tuck of Alltech. The Connie Doolan Memorial Trophy sponsored by Guinness was again won by the team of 2EVentures - a Council Sustaining Member company headed by Mick Tuohy. Seen at the prize-giving presentation were (from left): Owen Higgins of Guinness; Council Sustaining Member Mick Tuohy; Bobby Collins, Paul Coughlin and Council Treasurer Kieran Claffey joined by Council President Brian W. Stack. Welcome to the website of the Ireland-U.S. Council. Our mission is to build business links between America and Ireland. This site contains detailed information on the organization's programs and activities in both the United States and in the Emerald Isle. We value your interest in the mission of the Council and always welcome new members. We hope that you find the answers here to any questions you may have about us. If not, please contact us and we will be happy to tell you more. It was back in 1962 that, in preparation for the visit of President John F. Kennedy to Ireland the following year, two organizations were created as a measure to build institutional form around a structure to improve the relations between America and Ireland. One was dedicated to cultural relations - the American Irish Foundation, which has since merged into the American Ireland Fund. Your Council was the other and was aimed at building business bonds between America and Ireland. We cherish the shared commitments that connect us to our Council mission. During the past year, the Council has enjoyed outstanding support from members and from many benefactors, patrons and sponsors. On behalf of the Council's Board and the entire membership of the organization throughout the United States and in all parts of Ireland, we offer thanks for the support we continue to receive.